Polbase - Reference: Synthesis and biological evaluation of fluorinated deoxynucleotide analogs based on bis-(difluoromethylene)triphosphoric acid. Synthesis and biological evaluation of fluorinated deoxynucleotide analogs based on bis-(difluoromethylene)triphosphoric acid. 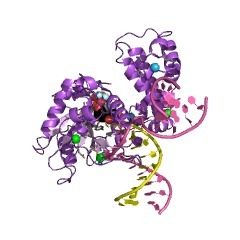 It is difficult to overestimate the importance of nucleoside triphosphates in cellular chemistry: They are the building blocks for DNA and RNA and important sources of energy. Modifications of biologically important organic molecules with fluorine are of great interest to chemists and biologists because the size and electronegativity of the fluorine atom can be used to make defined structural alterations to biologically important molecules. Although the concept of nonhydrolyzable nucleotides has been around for some time, the progress in the area of modified triphosphates was limited by the lack of synthetic methods allowing to access bisCF(2)-substituted nucleotide analogs-one of the most interesting classes of nonhydrolyzable nucleotides. These compounds have "correct" polarity and the smallest possible steric perturbation compared to natural nucleotides. No other known nucleotides have these advantages, making bisCF(2)-substituted analogs unique. Herein, we report a concise route for the preparation of hitherto unknown highly acidic and polybasic bis(difluoromethylene)triphosphoric acid 1 using a phosphorous(III)/phosphorous(V) interconversion approach. The analog 1 compared to triphosphoric acid is enzymatically nonhydrolyzable due to substitution of two bridging oxygen atoms with CF(2) groups, maintaining minimal perturbations in steric bulkiness and overall polarity of the triphosphate polyanion. The fluorinated triphosphoric acid 1 was used for the preparation of the corresponding fluorinated deoxynucleotides (dNTPs). One of these dNTP analogs (dT) was demonstrated to fit into DNA polymerase beta (DNA pol beta) binding pocket by obtaining a 2.5 A resolution crystal structure of a ternary complex with the enzyme. Unexpected dominating effect of triphosphate/Mg(2+) interaction over Watson-Crick hydrogen bonding was found and discussed.